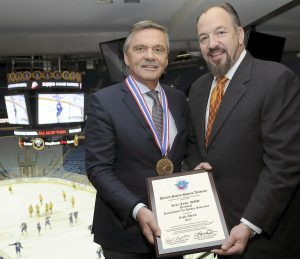 Dr. René Fasel, D.M.D., left, president of the International Ice Hockey Federation (IIHF) and an influential figure in ice hockey for more than 40 years, recently received the United States Sports Academy’s 2017 Eagle Award, the Academy’s highest international honor, from Academy trustee Joseph Szlavik at the 2018 IIHF World Junior Championship at KeyBank Center in Buffalo, N.Y.
DAPHNE, Ala. – Dr. René Fasel, D.M.D., president of the International Ice Hockey Federation (IIHF) and an influential figure in ice hockey for more than 40 years, has received the United States Sports Academy’s 2017 Eagle Award, the Academy’s highest international honor. Fasel recently was presented the award by Academy trustee Joseph Szlavik at the 2018 IIHF World Junior Championship at KeyBank Center in Buffalo, N.Y. The Eagle Award is presented to a world leader in sport to recognize that individual’s contributions in promoting international harmony, peace, and goodwill through the effective use of sport. The recipient of this award must have tempered strength with keen judgment in using authority wisely as a means of bringing nations together through sport for the betterment of mankind. In addition to his IIHF leadership, Fasel was the first ice hockey representative to serve on the International Olympic Committee (IOC) and he served as president of the Association of International Olympic Winter Sports Federations (AIOWF). As IIHF president, Fasel is credited with establishing closer relationships between the federation and professional organizations in North America, including the National Hockey League (NHL). Under his leadership, the top professional hockey players from the NHL competed for the first time in the Winter Olympic Games, participating in 1998 in Nagano, Japan. A dentist by trade, the Fribourg, Switzerland, native played amateur hockey for Fribourg-Gottéron before moving into international hockey officiating. He rose to the highest levels of hockey officiating before becoming president of the Swiss Ice Hockey Association in 1985. He was elected to the IIHF Council in 1986 and since has served as chairman of the IIHF Referee, Marketing and Women’s committees. Fasel was elected IIHF president in 1994 and the next year was appointed as the first ice hockey representative in history to the International Olympic Committee. In this role, he is credited with raising the stature of the sport of ice hockey enormously.  In 1997, Fasel was commissioned by the IOC to compile a study on the dental treatment of Olympic athletes at the University of Barcelona. He was re-elected for a fifth term as IIHF president in 2016. Fasel was elected as the winter sports representative to the IOC Executive Board for a four-year term during the 120th IOC Session in Beijing in 2008. The executive board is the highest body within the IOC and assumes the ultimate responsibility for the administration of the IOC. During the 124th session in London in 2012, he was re-elected to the board for another four-year term. Fasel served as the president of the Association of the International Olympic Winter Sports Federations between 2002 and 2014. He was also chairman of the 2010 Vancouver Olympics Coordination Committee. Fasel has been honored with numerous awards and recognitions throughout his career. In 2004, he was given the prestigious Legion of Honour Award which is the highest award given by the French Republic for outstanding service to France, regardless of the nationality of the recipient. Also in 2004, Fasel was awarded the Ukrainian VIZHIBU prize for significant contribution to the development and popularization of ice hockey in the world. In 2008, Fasel received the Special Award of the Swiss Association at their Centennial Gala, which honors personalities for extraordinary contributions to Swiss ice hockey. In 2011, Russia awarded him the Order of Friendship of Peoples by Russia. The order, also known as the “Druzhba” (“Friendship”), is the highest Russian award that can be presented to a foreigner. Fasel holds dentistry diplomas from the University of Fribourg and the University of Bern in Switzerland. He earned doctorate degree in dentistry from the University of Barcelona in 2008. The Eagle Award is part of the Academy’s Awards of Sport, which each year honor a wide range of accomplishments in sport and serve as “A Tribute to the Artist and the Athlete,” in conjunction with the Academy’s American Sport Art Museum and Archives (ASAMA). The awards recognize these men and women through the Sport Artist of the Year, Honorary Doctorates, Medallion Series, Distinguished Service Awards, Outstanding Athletes, and Alumni of the Year awards.